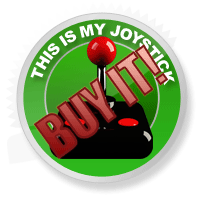 Max Payne 3 Review - This Is My Joystick! It’s been nine long years since we last saw Max Payne, and nine years is a long time for a franchise that in 2001 was already ahead of the curve. When the first Max Payne hit, it was revered for its deep story of a cop relentless in pursuit of the truth, after being framed for the murder of his family. With its gritty noir style, it set the bar high for video-game storytelling and, in many ways it has not even come close to being matched. Throw in the then-ground-breaking bullet-time gameplay, and Remedy’s game was an undeniable classic. In the time since the equally well-received sequel, developer Remedy decided to step back and start new projects, starting with a new pun-named character in Alan Wake. 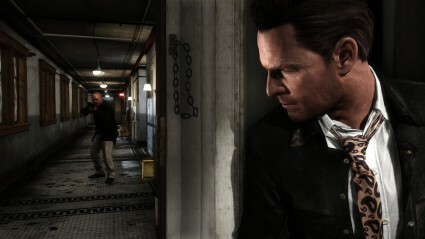 The Max Payne license has criminally sat dormant with Rockstar Games for nearly a decade. When Rockstar finally decided to show their hand, it wasn’t what people were expecting. A fat, bald Max Payne walking around the streets of the uncharacteristically bright locals of Sao Paulo, Brazil? Many were worried, and I have to admit that in spite of Remedy’s involvement and backing to the project, I too was concerned that the series was stepping too far away from its roots. As it turns out, we needn’t have worried. Rockstar have offered up one of the best shooters this generation has ever seen. Despite his fling with Mona Sax, Max is still very much a man hurting from the death of his beloved wife and son. The initial intro is a brilliant window into Max’s fragile state of mind, conjuring up memories of Francis Ford Coppola’s Apocalypse Now, as he morbidly self-medicates with a mixture of fine whisky and prescription painkillers. Now as an ex-cop with eight years since his last major drama, Max has decided that he needs a better life away from the only city he’s ever known. With connections through his friend Raul Passos, he takes up a job acting as a private security guard for one of Brazil’s richest families. Despite his constant hurt and his alcohol problem, Max has success for a while, before it all comes crashing down in the only way he’s only ever known; a hail of bullets. After several foiled kidnap attempts on the Branco family under his watch (mainly on Rodrigo, his boss), Rodrigo’s wife is the one eventually and successfully taken. Max endeavours to get her back, uncovering a larger, horrifying conspiracy in the process, one that’s plaguing the whole of Sao Paulo. I’m going to cut short there, because divulging more would absolutely ruin a hugely enjoyable and mature storyline that ebbs and flows at the perfect pace throughout. While it’s true that in style and setting, things have shifted slightly away from the comic book noir well-known from Max’s last two outings, this is still very much Max Payne as we know and love it. For a start, the dialogue is still pure Max Payne, gritty but soulful; and although the game puts a focus on more of a heavily distorted action movie vibe, it’s still noir in its purest essence. Max still talks to the player about what he’s feeling, what’s happening to him, and it’s as sharp as ever. Everything from his willingness to leave New York, his eventual new look, and his stake in what goes down in Brazil is clearly explained in logical steps, but it’s nothing compared to the quality of the overall plot. 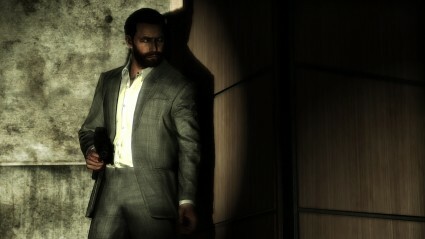 Rockstar have done wonders in bringing the Max Payne ethos into the modern era, while still paying much respect to Remedy’s previous work in the way the game frames itself, especially in cut-scenes. They’re stylish, action-packed and phenomenally well-directed in classic Rockstar style, but they also serve a technical purpose, loading the next portion of gameplay before seamlessly blending right into it without a let up in pace. It means that you’re never left looking at dull loading screen past the initial load. It sounds a small thing, but it makes such a big difference in action. 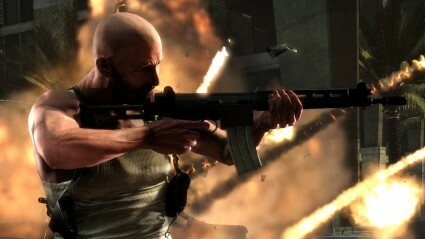 In many ways, Max Payne 3 isn’t too big a departure from the previous games in how it plays. You’ll still be using bullet-time to utilise Max’s ability to read combat in slow motion, and bullet-dodge to perform amazing, slow motion jumps through the environment while firing relentlessly into attackers. This time, however, it’s a lot more refined and responsive, but with a satisfying weight to it, playing all the more elegantly. I probably don’t have to tell you how impressive the combat is as a result, allowing you to orchestrate elaborate and dramatic shootout sequences worthy of the best action films around. Imagine jumping through a window and sliding across a table on your side, dual-wielding pistols as the bullets whistle past your head. Imagine walking into a room and pistol-whipping the nearest enemy to you before putting one in their head at point-blank range, then taking cover behind a pillar and initiating bullet-time to bag a load of headshots from across the room. Imagine jumping bang in the centre of a room full of enemies, taking as many out as you can before you hit the ground, and then staying on the ground, rolling over and dodging shots as you pick off the stragglers. This game lets you do all that and more, and it really is as awesome as it sounds, especially against enemies that get smarter the further you get in. As you work your way through the ranks, enemies will start to take cover and look to flank you whenever you’re pinned down. They’re deeply aggressive, and the game leaves you feeling constantly pressured to make your move. It’s adrenaline-charged stuff. If the combat wasn’t already brutal, it gets more so when you kill the last enemy in the room. As with the previous titles, the camera changes to a more dramatic angle (not always following the bullet this time) as the shot hits the intended victim, graphically and vividly showing the damage dealt. You can even be ruthless and continue firing in this mode, and the game makes sure to show you every subsequent bullet that hits. This sequence never gets boring either, serving as a rewarding money-shot to sign off on spectacular shootouts; especially exhilarating when you can see Max in full flight in the distance, pulling the trigger each time you do. Of course, a game in constant slow-motion wouldn’t pose that much of a test on face value, but thankfully, there is plenty of challenge to be had throughout the campaign, even on normal difficulty. Before you even start the game, you can tinker with the type of aiming system. There’s hard and soft auto-aiming, with classic free aim also readily available for purists. As always, you never get an unlimited use of bullet-time either, having to earn it by taking shots at the enemies without aid, providing a steady balance between risk and reward. You also have to be very aware of your environments this time around, as a misplaced bullet-dodge into a nearby wall or desk will see your slow-motion theatrics cut bluntly short, sometimes sorely for Max. Jumps over balconies or down large flights of steps will also only end painfully if you’re not careful. It may seem a little harsh, but it’s a step towards realism and helps the game feel less flighty than its predecessors. The other element of challenge comes in force thanks to Max’s ironic low threshold for damage. You can be gunned down in a matter of milliseconds if you’re not careful, so you need to make sure that you make smart use of the new cover mechanic and the available bullet-time you have in any given scenario. Thankfully, as before, you will need to find Max’s favourite vice (painkillers) to heal. With how easy it is to lose half your health, you’ll often be scrambling around rooms like a desperate smack addict, searching for one more hit. 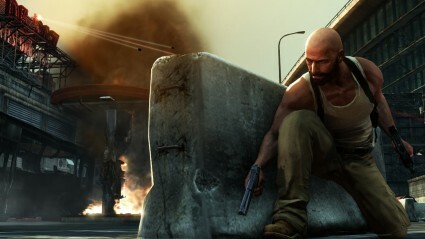 If you happen to be shot to breaking point, you’ll occasionally be thrown into ‘Last Stand’ mode, in which Max spins in slow motion towards his attacker. If you get the kill quick enough, you’ll get some health back at the expense of some pills, but you’ll still be alive to clear out the room. If not, you’ll be treated to a short, vicious death. Pills won’t be the only thing Max has to keep an eye out for, though. You can find golden gun parts hidden around all the levels, and when you manage to find all three parts for a particular weapon, you’ll be treated to a larger clip and a damage increase. There are some other treats to find, such as conversations with particular characters, interactions with certain objects in the backdrop and, of course, plenty of Easter Eggs harking back to Max’s history. Once you’ve finished the excellent campaign (which isn’t short by today’s standard, by any stretch), the fun doesn’t have to stop thanks to a nicely implemented ‘Arcade Mode’. Here you’ll find a score attack playthrough, where you must head through the missions racking up as many points as you can by killing in style and chaining together multipliers. Series stalwart ‘New York Minute’ also makes a welcome return, starting you on each level with just one minute on the clock. Kills will bag you additional time, with extra bonuses for headshots. This mode can be frantic as hell as you try to rack up the time to complete the given level. What’s really cool here is that you also get a pick of Max’s character model, not only from the various outfits he wears throughout the campaign but also from the previous games. This allows you to see how the constipated look from the first game fares by today’s standards, or the more maturely realised Max from the sequel. Welcome fan service all around. True to Rockstar’s usual form, Max Payne 3 is a gorgeous-looking game that benefits far more visually from its linear and narrative constraints than a lot of their open-world titles. The game is rich in atmosphere, and it’s hard not to be regularly impressed by the quality found in the diverse range of environments over the game’s fourteen chapters. There’s also a real range of colours used to bring Brazil to life, but keeping it realistic too, which is a refreshing change from all the browns and greys used in most shooters this generation. I also can’t stress in words just how impressive the OCD level of detail that’s gone into every aspect of the environment is. The really impressive stuff comes in the attention to detail in Max’s interactions with that environment, and here the animation is second to none. Run out of bullets and need to pick up a nearby weapon? Max will roll over to it, picking it up in one smooth process to keep the gameplay flowing. Use cover below a window, and Max will knock the window though with the end of his gun before attempting to shoot. If you pick up a heavy-duty weapon, but switch to your pistol, he carries it by the barrel in his free hand, rather than attaching it to an imaginary back holster or putting it in an invisible inventory. It is the little touches like this that help put Rockstar ahead of their contemporaries. One thing that I know has a few people divided is the static, digital blur mostly predominant in cut-scenes. This will probably bring back unpleasant memories of Kane & Lynch 2 for some, and it is a little off-putting at first, I must admit. It does blend in pretty well overall, however, adding real style to proceedings and helping to reinforce Max’s self-inflicted haze. Rest assured, production value really does take centre stage. Series fans will rejoice that the original theme makes a welcome return in all its bass-driven glory. It’s still as appropriately mournful and sad as ever, tailored perfectly to Max’s outlook on life. The punchy sounds of the weapons, however, are perfectly accompanied by slow-burning, repetitive stabs of electronic bass and synth. These remind heavily of themes from the movie Heat, or some of John Carpenter’s work to a lesser degree. The voice acting is wonderful also, like you’d even expect anything less of this character or of something Rockstar put out. James McCaffrey reprises his role as our troubled hero, reinforcing the feeling that we’re revisiting an old friend later in life, and the rest of the cast back him up splendidly. The multiplayer is freer than the campaign, but no less fun. Multiplayer that’s supposed to have slowdown! I’ll be honest. I was expecting a car wreck when it came to Max Payne’s new multiplayer, but I’m pleased to say that I was completely wrong. It’s a balanced and polished component that is hugely fun, with an addictive unlock system that should keep you coming back for more. You’ll start with only a handful of loadouts, but eventually will be able to unlock all manner of weapons and gear, including new character models and unlockable classes. You’ll also be able to utilise perks, known as ‘Bursts’. After unlocking them, as you fill up on adrenaline in-game by getting in the thick of the action, you’ll be able to use these different abilities for temporary periods. Bullet-time is the default Burst and, much to my surprise, it actually works. Rather than slowing down everyone on the map, it slows down the players that are in your direct line of sight. It takes a little while to get used to, but it does work surprisingly well, never feeling tacked on. Other perks see you getting increased armour or health for short periods, while in the more extreme examples, ‘Paranoia’ can rip a team apart from the inside out. In amongst the typical Deathmatch and Team Deathmatch modes, you’ll find a couple of original unlockable modes. Payne Killer acts as ‘Tag’ with guns. Here you’ll need to kill the player designated as either Max or Passos to take over their role, earning you more points the longer you survive with increased attributes. Gang Wars is the real gem, though, which reminded me heavily of Killzone’s Warzone in its ethos. There are five rounds in this team-based game and the core objective changes over each round. This adds a bit of flair and unpredictability to proceedings and keeps the experience fresh each time. I’ve only really scratched the surface with the multiplayer myself, really, so this part of the review will be the least conclusive, but what I’ve found so far is a solid multiplayer experience that I want to keep playing. It’s not often a multiplayer mode grabs my attention for more than a week or so these days, especially with limited available time and other reviews on the horizon, but this has certainly left me wanting more. With ‘Crews’, vendettas, stats and other little features at its disposal, I’m sure it’ll keep others going for more than a few months. 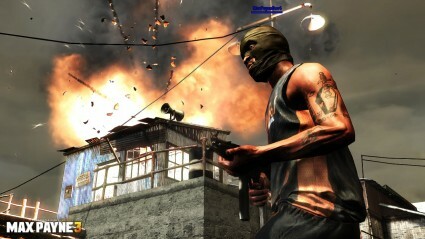 Rockstar have done it again as far as I am concerned: Max Payne 3 is an unquestionable masterpiece. It’s a game that fully respects its rich heritage too, making sure to adhere to the series’ core principles wherever it possibly can, but goes the extra step and improves on that classic formula massively on every conceivable level. While in the previous games, the strong narrative probably helped to cover over any minor shortfalls in gameplay, here both elements are very much on more of an even keel thanks to the way they’re superbly woven into each other with terrific pacing. The slick and unapologetically brutal combat offsets the grisly story, and neither element gets boring before the end of a pretty meaty campaign. Throw in a more-than competent online component and the handful of additional, addictive single-player modes, and you have yourself a game fully worth the asking price. Rockstar really have crafted one of the best third-person shooters this generation here, and personally, it’s one of my favourites of all time. Kudos.